Today we want to introduce you to another one of our NAYC teen session speakers. Jonathan Quinones was born in McAllen, TX in 1986. He served as the Youth Pastor for Revival Center in Modesto, California for 11 years. He continues to serve in ministry and is currently the Administrative Pastor at Revival Center under the leadership of Pastor Todd Johnson. On July 30th, 2011 he married the love of his life, Ashley, and they are the proud parents of two boys, Braiden (5 yrs) and Gavin (2 yrs). He began serving on the Western District Youth Committee in 2011 and in 2015 he was elected to the position of Youth Secretary of the Western District and is currently serving in that role. JQ: 1) Helicopter 2) Pilot 3) Lunchable (The one with turkey, cheddar cheese, and reese’s cup ) for the ride out. JQ: Sorry, I don’t know any funny jokes, it’s all about funny meme’s now. JQ: I know there are several to be embarrassed about but the one that sticks out to me right now was when I giving my absolute best in one of our youth services and was trying to make a “powerful, life altering” point and for some random, unknown reason, my voice completely tweaked and I sounded like Kermit the Frog. NOBODY GOT ANYTHING FROM THAT SERVICE, except that for a brief moment, Kermit was their youth pastor. smh. JQ: I cannot say that I have one favorite, so I’ll give you my most recent one, Atomic Habits by James Clear. Also, children’s bibles have the BEST illustrations so I enjoy reading those with my boys and seeing the way it adds to their little imaginations. JQ: Somewhere relaxing where they have great tacos and there isn’t a Target that my wife “needs” to stop at. As a husband and father, I’m sick of Target runs. JQ: It is most definitely playing at the park with my sons, Braiden and Gavin. JQ: Oh my. To be honest, I get nervous just thinking about it, but to answer the question in short, you have to prepare the way that you always prepare to minister and thats: Prayer. Fasting. Reading. Studying.Working. Repeat. and you have to be yourself. You cannot get caught up in trying to be somebody that you’re not. People want to hear from the Word of God and not what we think would be “impressive”. 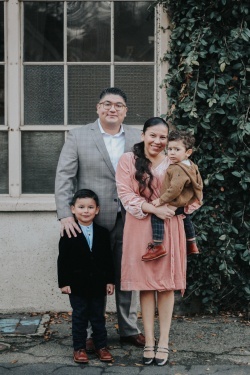 JQ: I’m grateful to have been raised in the church from a young age and my parents instilled in me a love for God and for people and to do my best to serve God and others. I’m thankful that God’s grace and mercy has kept me and allowed me the opportunity to continue to serve and now raise my family the same way. JQ: It seems like everyone remembers a call, but for me, it was text. *insert preachy organ music* When you open your Bible, you’ll find God’s text messages for your life! *rest of the musicians come. Totally kidding! Real talk, I was 14yrs old when I felt the call of God on my life for the very first time. I didn’t start teaching or preaching at that age, but that was when I made a decision that I was going to be all in and started taking the things of God more serious. I was young and still had fun and was just myself, but I did my best to live with knowing the call of God was on my life and I was going to be obedient to Him. At 16 I really started teaching Bible Studies and preaching at our local Juvenile Hall and California Youth Authority (I vividly remember having to get the permission slip signed by my parents because of my age) and since then I’ve just continued in ministry through bible studies and teaching/ preaching. JQ: You must be intentional about your relationship with God, we do not drift closer to Him. Daily devote your life to God, Your effort now will make a difference all throughout your life. God is for you, with you and in you! Make the personal decision to live for God and do it no matter what else takes place in your life or in your surroundings. Do not allow the disappointing actions from yourself or others to discourage you from moving forward with God. Walk with God and you’ll never be alone. The enemy will attempt to get you to go another direction and if it fails at that, it will attempt to frustrate you with the pace that you are moving, but trust in God and keep walking with Him. Never stop growing. JQ: You are going to have an awesome week at NAYC and there is so much that will be contributed towards your life while you are there, to take it home, we all must embrace it and apply it. Take to heart the words that are spoken, take notes and accept the challenges that are given. When you get home, connect with your pastor and youth pastor, develop new habits, give yourself to prayer, fasting and the Word of God, serving your church and your community. What we experience at NAYC will only be magnified at home rather than diminished.